GE’s advanced transducer technology, like XDClear, has provided exceptional image quality to physicians for years. As physicians’ needs continue to grow, GE’s probe technology grows with them. Much like the Philips X5-1 xMATRIX Cardiac probe on the Philips Epiq 7, the GE 4Vc-D Matrix 4D Cardiac Probe on systems like the GE Vivid E95 delivers 2D, 4D, color and Doppler image quality performance at ultra-high volume rates – all this from one single probe. On the GE Vivid E95, the GE 4Vc-D can even take advantage of GE’s HDLive 4D imaging technology! GE’s Single-Crystal Technology uses newer piezoelectric materials to increase bandwidth, offering enhanced signal to noise and enhanced axial resolution and penetration. This advanced probe technology is available in the latest-generation XDClear GE ultrasound probes. Matrix Array Technology uses multiple rows of crystals to help achieve uniform resolution throughout the field of view. 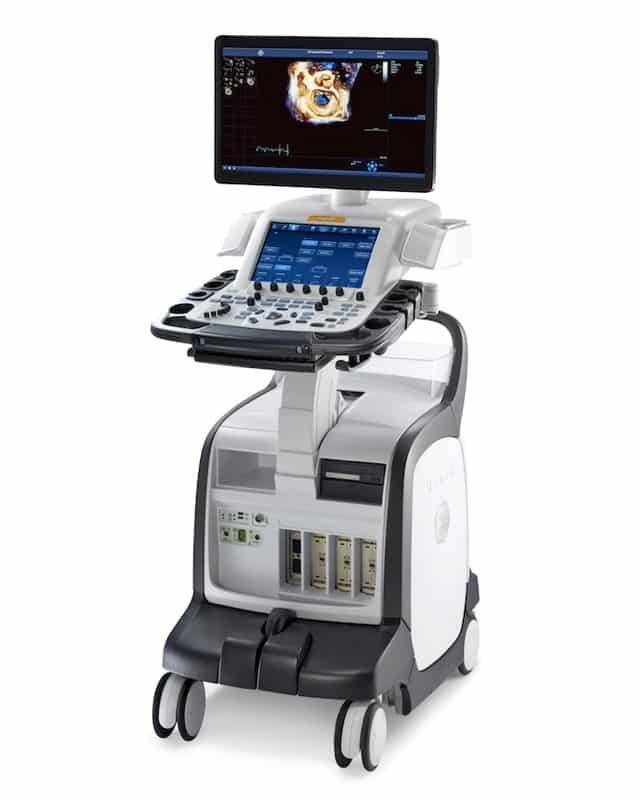 An example of this technology can clearly be seen when live-scanning with the GE 4Vc-D.
Probe Repairs Probo Medical can offer new and refurbished GE 4Vc-D ultrasound transducers and also offers certain repairs as well. Call us today at 317-759-9210 or fill out the form below to receive an exclusive quote! Need to purchase a compatible system to run the 4Vc-D? Call our partners, MedCorp LLC. They have GE Vivid E95’s and GE Vivid E90’s in stock ready to ship with our GE 4Vc-D’s! Call them today at 1-866-828-1800.